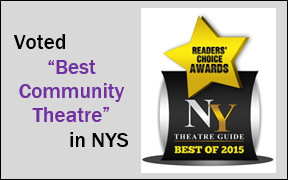 Home Made Theater, the resident theater company at the Spa Little Theater in Saratoga Springs, is pleased to offer two special student matinee performances during our 2018-2019 holiday season. This year, our Theater for Families production will be A CHRISTMAS STORY. We have two dates scheduled for this show on Tuesday, December 11 and Thursday, December 13 at 10:00 A.M. School group ticket prices are $9.00 per student with one complimentary teacher/chaperone ticket per every ten students. Since we are located in a New York State park your public school may be eligible for a refund of up to $1,000 for the cost of your field trip to HMT. Click here for more details. In the past, student groups have enjoyed our productions of A CHRISTMAS CAROL, A CHARLIE BROWN CHRISTMAS, MIRACLE ON 34TH STREET, THE JUNGLE BOOK, CHARLIE AND THE CHOCOLATE FACTORY, THE WIZARD OF OZ, OF MICE AND MEN, CHARLOTTE’S WEB, and TO KILL A MOCKINGBIRD among others. We hope that your school will take this opportunity to develop your student’s appreciation for the arts. If you would be interested in bringing a group to any performance, please fill out the interest form and return it to HMT, or e-mail the information to smiller@homemadetheater.org. You will be contacted to make arrangements. For further information, please feel free to contact HMT at (518) 587-4427 or the above e-mail address.